He wasn’t part of the landmark Outlaws album, but David Allan Coe has been more the living embodiment of that label than any other artist in the history of country music. Coe was born in Akron, Ohio in 1939. He spent his youth in and out of reformatory schools, the beginning of a long history of run-ins with the law. After spending most of his twenties in prison, he moved to Nashville in the late sixties. His style was jarring, with tattoos, long hair, and piercings, and for a stretch, he lived in a hearse parked right outside the Ryman Auditorium. Major labels wouldn’t bite early on, but he did sign with Plantation Records in 1968, releasing albums that reflected on his experiences in prison. After a stint on tour with Grand Funk Railroad, he adapted the Masked Rhinestone Cowboy persona, with a little help from Mel Tillis, who donated a rhinestone suit for part of the costume. He was soon commanding large audiences, but his outlandish persona kept the major labels at bay. In the end, it was his songwriting that caught the attention of Columbia. 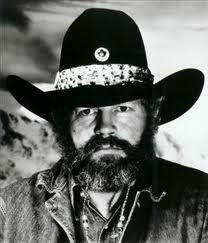 The label signed him after he penned the #1 hit “Would You Lay With Me (In a Field of Stone)”, recorded by Tanya Tucker. Despite it being his songwriting that landed him the deal, it was a cover of Steve Goodman’s “You Never Even Called Me By My Name” that first enchanted radio programmers. While radio play was inconsistent during the seventies and early eighties, Coe amassed a stunning string of albums that rank among the greatest of that time. Along with his contemporaries Waylon Jennings and Willie Nelson, Coe embodied the new album-oriented era of country music, a genre that had been dominated by singles up until that point. Even though Coe would score a pair of top five hits in the early eighties (“The Ride”, “Mona Lisa Lost Her Smile”), his biggest success was still as a writer. When Johnny Paycheck covered “Take This Job and Shove It”, it was a #1 hit in 1977. Besides being a popular catchphrase, it was also the foundation for a movie based on the song’s storyline. Coe’s career was also limited by his association with underground albums that were in remarkably bad taste. His reputation was further harmed, albeit unfairly, by the Napster era of illegally downloaded music, which falsely credited racist songs by Johnny Rebel as songs by David Allan Coe. Coe continues to be a major force on the road, even in his early seventies. For lovers of Outlaw music, and all serious historians of the genre, his classic Columbia sets remain required listening, and better capture his talent than any of the various compilations released over the years. There’s just something you’ve gotta like about a guy who can have a career that includes something as heartbreaking as “Mona Lisa Lost Her Smile”, as raging as “Take This Job And Shove It”, and as funny as “You Never Even Called Me By My Name” (which is known by many as “The Perfect Country & Western Song”). That takes a ton of talent, and a lot of nerve, which D-A-C had in spades (IMHO). Really glad to see you put David All Coe on the list. Truly a great country music artist, and highly underrated, mostly because of his own behavior I’m sure, but underrated nonetheless. He’s also a fascinating human being. I highly recommend his books, though I only have the first 2 myself. I would point out that I think his best work isn’t really represented in his singles. My favorites by Coe are songs like ‘Honey Don’t’, ‘Spotlight’, ‘Another Pretty Country Song’, and even his more straightforward songs like ‘Whole Lot Of Lonesome’ and ‘She Finally Crossed Over’ carry those biting overtones with them. I’d also add I’ve Got Something To Say and Human Emotions to your essential albums list. Can’t believe I forgot to add ‘I Still Sing The Old Songs’, my favorite among D.A.C. songs.